The HHWT-SD1 is a general purpose handheld instrument capable of measuring the pH, Oxidation-Reduction Potential (ORP) or conductivity of a solution, as well as its TDS (Total Dissolved Solids), DO (Dissolved Oxygen) or salt content. Using the included conductivity/TDS/salt probe, an optional DO probe, and optional ORP or pH electrodes the meter can measure pH from 0 to 14, ORP from -1999 mV to 1999 mV, conductivity up to 200 mS (milliSiemens), TDS up to 132,000 ppm, DO up to 20 mg/L, and salt content up to 12% by weight. The HHWT-SD1 is designed for water conditioning, wastewater monitoring, beverage production, aquaculture (fish farming), aquariums, pulp and paper processing, electroplating, and photography applications. A front-panel pushbutton enables rapid switching among the meter’s four measurement modes. Because it is microprocessor-based, the HHWT-SD1 is portable, reliable and has the large storage capacities that SD memory cards offer. 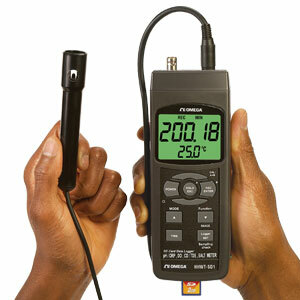 Measurements can be made automatically at any sampling rate between one second and nine hours. After timestamping and storing the measurements on an SD card plugged into the meter, the user can remove the card and plug it into to a computer either directly or via a USB card reader. The values are stored on the card as files with the .xls extension, which can be opened by Microsoft’s Excel® application. Note: Comes complete with meter, combination conductivity/TDS/salt probe, hard carrying case, 2 GB SD memory card and operaror’s manual (solutions sold separately).